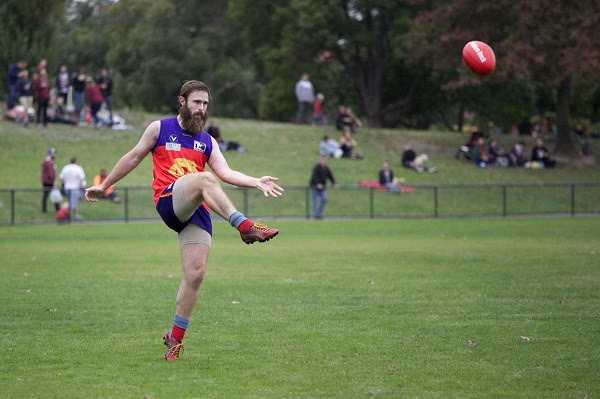 You can’t miss Ross Borland, usually guarding the backline, working hard, keeping his opponent honest and sporting one of the best bushranger beards in Fitzroy. The man his captain describes as a ‘true Royboy’ has just reached his 150 Fitzroy and VAFA game milestone and is pushed to get back into the senior side after recovering from a quad strain. 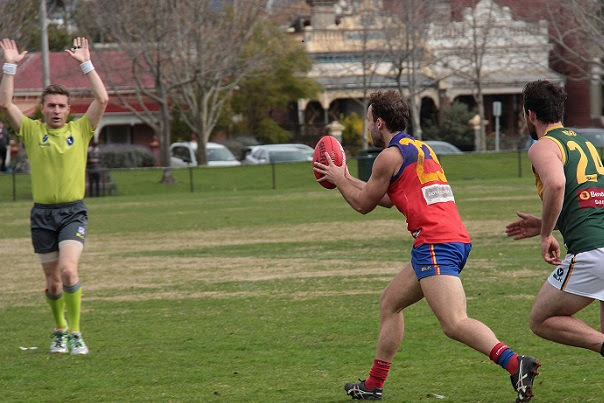 Fitzroy captain Rory Angiolella speaks very highly of his long-time team mate. “From the time he came to the club as an 18 year old he was a senior player and as the years have gone by he has adapted his game and played a number of different positions and roles, from full forward to ruck to onballer, and even playing tall down back,” Rory said. Ross started with Fitzroy in 2006 (playing his first senior game in 2008 whilst still eligible for Under 19s) and has only ever played in a ‘Roys jumper, including in his junior days. One of the things that has kept him with the club is the playing group he has come through with and their commitment to sticking together – guys like Rory, Sam Baker and Tom Cheshire. And one of his best memories is one he shares with all of them – the prelim-final win in D1, which propelled Fitzroy into Premier C.
The man with a Masters in Special Education, says it does seem strange to be back training and playing without his fellow backmen Al Green, Matt Brown and Tom Biscaro, but says the turnover in players is all part of amateur footy. On the flip side is all the new blood coming into the team. “It’s pretty great having all these fantastic new, young players with the energy and expectation they bring. I think having so many of them come in together also makes their transition easier. “With such a lot of change the aim is to get the team playing a good brand of football under Mitch and then push for finals,” Ross said. Ross’s enthusiasm for the injection of young talent in the senior side, is matched by his support for the introduction of the women’s teams and what he sees as “a fantastic step for the club”. Ross can often be found sitting quietly (or not) watching the Fitzroy-ACU women honing their skills, whether in the wet on a Friday night at Vic Park or in the sun on a Sunday, depending on the draw. Congratulations Ross on your football milestone and on your recent First XI cricket premiership with Royal Park Brunswick. 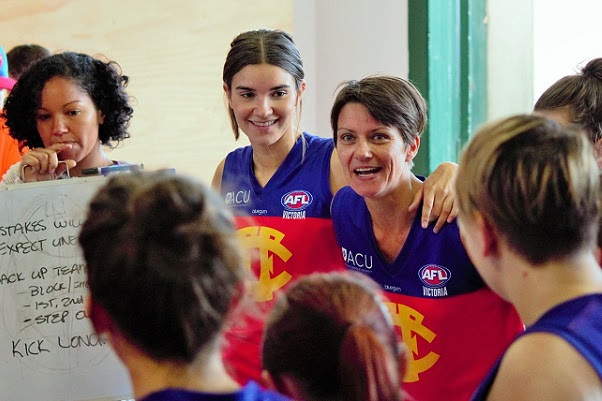 Fitzroy-ACU Women 1 heads into the full draw of the first Wilson Women’s Premier division undefeated as the VAFA released its first full series of divisions and draws this week following the grading rounds. The full draw comes into effect this weekend. Following its comfortable win over Ajax on Sunday, Fitzroy-ACU will be joined in Premier Division by Caufield Grammarians, Marcellin, Melbourne Uni, Old Trinity Grammarians and Old Xaverians, along with SKOB Saints and Brunswick Renegades. Ajax asked to be dropped down into a lower division. This Saturday, the Fitzroy-ACU Women 1 will face SKOB Saints for the second time in three weeks at Ramsden Street Oval at 2pm. They will be buoyed by their recent win over the Saints, but mindful that their opposition finished strongly in the wet at Vic Park in their recent meeting. After three very hard weeks, with several players who were playing Australian football for the first time, our Women 2 team has been placed in VAFA’s Development Division 4. The attitude of the team has been nothing short of fantastic as they’ve faced some very experienced sides, including Melbourne University and West Brunswick. On Saturday there were scenes of great jubilation as the first goal of the season was scored by Tess McDonald. The experience of playing against higher ranked teams will stand them in good stead as they start the season with the Brunswick Renegades (2), Bulleen Templestowe, Canterbury, De La Salle, Hawthorn, SKOB Saints (2), South Melbourne Districts, St Mary’s Salesian (2) and Swinburne University. You can find out more about the women’s competition here and the VAFA is progressively updating its website with the details of each round and the full fixture. 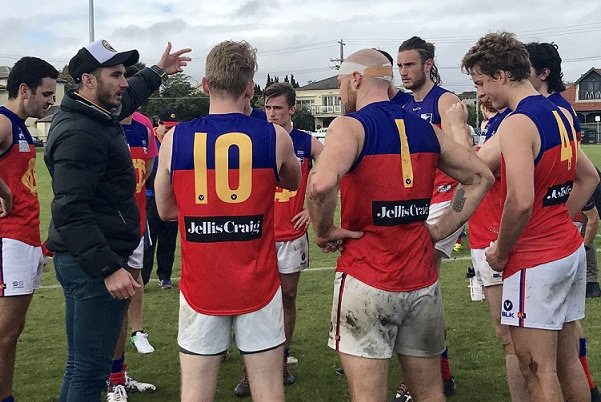 A combination of renewing acquaintances with Nick Mitchell, re-forming an Adelaide playing connection, and an open welcoming club environment have made Archie Whiting pretty happy about his choice to come to Fitzroy as the new line and development coach. Appointed just before the start of the season, Archie says he’s loving Fitzroy so far. “Everyone has been really welcoming. It’s such a big community club, which I love, and it reminds me of country footy clubs like Hamilton and Barwon Heads to a certain degree. Fresh from playing with Barwon Heads, Archie says the stars aligned this year, living and working in the inner city, his former team mate Nick Mitchell approached him with the coaching opportunity. Archie has future senior coaching ambitions of his own, but right now it’s his recent playing experience and strategic strengths which are benefitting Fitzroy. All clubs look for recent playing experience on their coaching panel and Archie says its important in helping develop a strong connection to the players and how they are adapting to changes in footy. In fact Archie hasn’t entirely put away ambitions of pulling on the mighty Fitzroy jumper, despite his injury-prone career. Archie started his football at the Hamilton Magpies in South West Victoria and was lucky enough to play for Vic Country in the under 16s. “I remember fondly getting a serious footy lesson from Bryce Gibbs; it will scar me for life. “I then worked my way up through the North Ballarat Rebels in the TAC Cup playing 25 games and was named Co-Captain of the Rebels for the 2007 season. “I was never a serious chance to get drafted and was lucky enough to get contacted by Sturt in the SANFL to do a pre-season and they put me on their list for the 2008 season (it was during this time he played footy with Fitzroy’s number 44 Peter Baccanello). I was pretty sore in my groins at the end of the 2007 season and only played 10 games in the under 19s that year. “I have had a number of injures that have meant I haven’t played a lot of senior footy. I had stints at Monash Blues, Old Geelong in the VAFA before playing with Barwon Heads last year,” Archie said. Following their positive start to 2017, the Fitzroy Senior side was given something of a wakeup call on Saturday out at Brighton Beach Oval when the top side Old Brighton Grammarians blew them away in the final term to win 16.12.108 to 4.5.29. Max Ellis had the unenviable task of playing on Alex Mastromanno who kicked seven goals in a powerful display for Old Brighton. Whilst Fitzroy’s team defence stood up for close to three quarters, the team just couldn’t find a way to score themselves. Playing his first senior game for the club, Mitch Bottomley looked lively and competed well all day. Early in the game Lewis Pavlich was everywhere and worked incredibly hard to keep Fitzroy in touch showing both the attacking and defensive side of his game. Aiden Burke also worked hard in and under the packs against some very big bodies. Mark Obushak and Peter Baccanello defended dourly all day, with Obushak named best player. The last quarter fadeout was very disappointing. The team is back home at Brunswick Street this week but is likely to face another tough test against St Bernard’s, who are undefeated and coming off a very good win over Old Carey at the Carey Sports Complex last week. Development coach Archie Whiting says the key for Fitzroy against St Bernard’s will be to significantly increase the workrate and pressure around the ball and move the ball faster when in possession. This Saturday 6 May please join us at The Royal Derby Hotel, home of our major sponsor, for the post-match function after Fitzroy takes on St Bernard’s at Brunswick Street Oval. A couple of functions booked at the community rooms have seen us make a slight change to the usual post-match drinks and best player announcements, a quick five minutes up the road at The Derby from 5pm. The St Bernard’s players and supporters will be joining us and the function room has been booked. Despite the demands on the community rooms, the BBQ and canteen will operate throughout the day as normal. Phew! We will be back to the usual proceedings for the week after, which is also a home game. 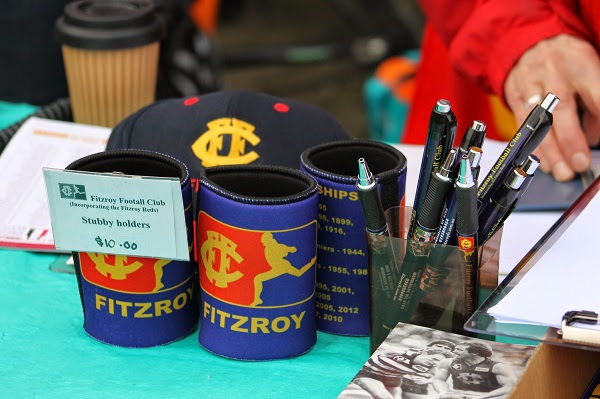 Your choice of a Fitzroy apron, scarf, cap or stubby holder is on offer if you complete the Fitzroy Football Club survey being run by Sports Media students from Holmesglen. If you complete the short online survey and provide your details (which is completely optional) you will go into the draw for a prize of your choice. The survey is open now and will close on Friday 12 May. The students have been working with Fitzroy Football Club as part of their course and next week we will be running a survey to gather information to feed into a proposed marketing plan they will develop for the club. The VAFA will acknowledge its umpires this weekend as part of Community Umpiring Round. 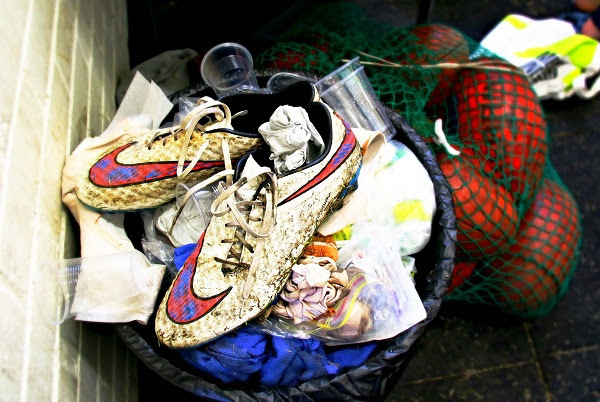 It’s definitely a tough job and often we don’t acknowledge that we can’t really play the game without them. Fitzroy, like others clubs, is always on the hunt for new umpires – boundary, goal, field – particularly having added three new teams in as many years. If you are keen to get involved, please speak to Director Football Operations, Sharon Torney.